Stir together Cilantro Salsa ingredients; cover and refrigerate. 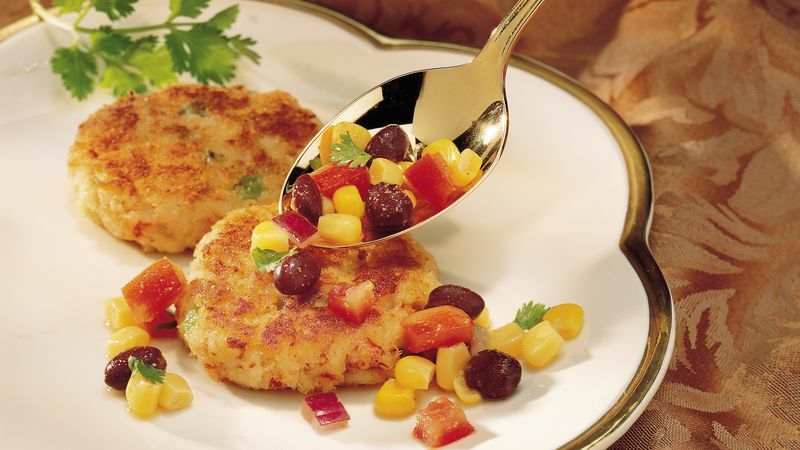 Stir together Crab Cakes ingredients--except 2 tablespoons vegetable oil and 2/3 cup bread crumbs. Shape mixture into 16 cakes, about 2 inches in diameter. In 12-inch skillet, heat oil over medium heat. Coat crab cakes with 2/3 cup bread crumbs. Cook in oil 3 to 4 minutes on each side, turning once, until golden brown. Drain on paper towels. Serve with salsa. Save time by making the salsa up to 24 hours before serving. Use lemon juice for the lime juice for a slightly different flavor. Mix and shape the crab cakes up to 24 hours before cooking; store tightly covered in the refrigerator.